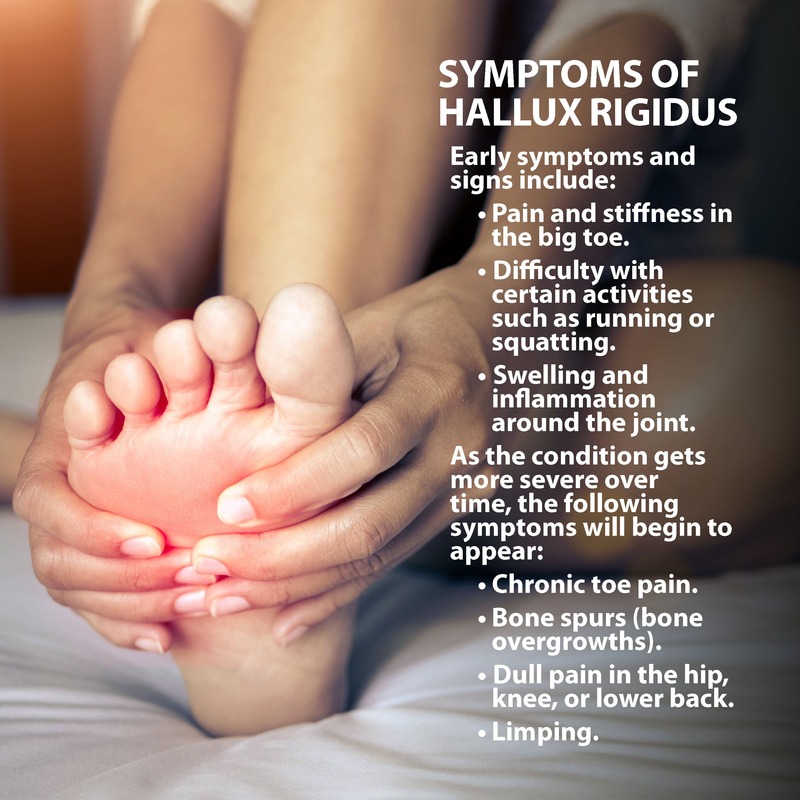 Hallux Rigidus (also known as Hallux Rigidusis) is a condition that causes the joint at the base of the big toe to stiffen and become rigid, resulting in pain and limited motion. This condition worsens over time, resulting in increased pain and stiffness until treated. Many cases of Hallux Rigidus can be treated non-surgically, but surgery is usually recommended if the non-surgical treatments are unsuccessful or if the Hallux Rigidus severe. The big toe consists of two joints: the metatarsophalangeal (MTP) joint and the interphalangeal joint. The interphalangeal joint is located in the middle of the toe. 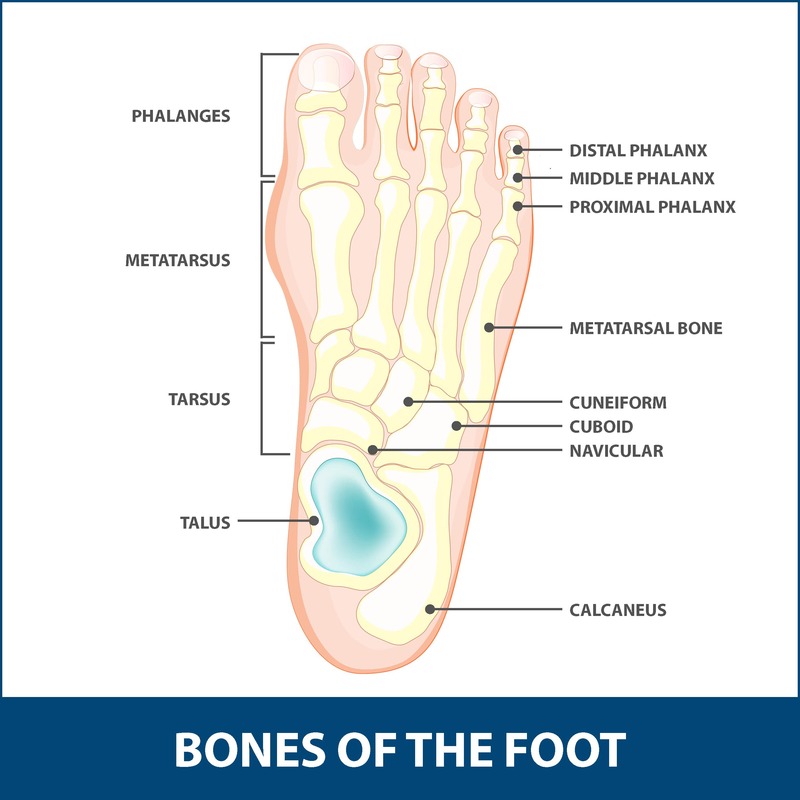 The MTP joint is the largest of the two, located where the first long bone of the foot (metatarsal) meets the first bone of the toe (phalanx). Hallux Rigidus is a joint condition that causes the joint at the base of the big toe (MTP Joint) to stiffen until it can no longer move. This condition can be very debilitating since we use the big toe to walk and stand. Hallux Rigidus progresses over time, meaning it is unnoticeable at first and gets worse over time. When the big toe first starts to stiffen, it is called Hallux Limitus. Once the joint is completely stiff or rigid, the name of the condition changes to Hallux Rigidus. The exact causes of Hallux Rigidus are unknown. Overuse of the big toe joint (MTP joint), injuries, inflammatory diseases like rheumatoid arthritis or gout, and foot structure abnormalities are all thought to be potential triggers of the condition. Difficulty with certain activities such as running or squatting. Dull pain in the hip, knee, or lower back. The sooner the condition is diagnosed, the easier it is to treat. Your Florida Orthopaedic Institute physician will look at your big toe and check your range of motion of the MTP joint. X-rays may also be taken to determine if any bone spurs or abnormalities are present. There are both surgical and nonsurgical treatment options available for Hallux Rigidus, but non-surgical treatments are recommended first. Surgical treatments are only recommended if non-surgical treatments are unsuccessful or if the Hallux Rigidus severe. Medications such as Advil and Motrin (ibuprofen) help reduce pain and inflation. Proper footwear. Shoes with a large toe box put less pressure on the toe. Stiff or rocker-bottom soles relieve pressure on the big toe and reduce pain. Orthotic devices. Custom orthotic devices also relieve pressure on the big toe and reduce pain. Physical therapy. Ultrasound therapy or other types of physical therapy can provide temporary relief. Injection therapy. Injections of steroid hormones (corticosteroids) may also be recommended to reduce inflammation and pain. Cheilectomy is a very common surgical treatment used to treat Hallux Rigidus. During this procedure, some of the bone and the bone spur on the top of the MTP joint are removed, giving the big toe more space to bend and move. Since the big toe will have more room to move, the pain caused by Hallux Rigidus is alleviated since the big toe is no longer rigid. Cheilectomy is an excellent choice of procedure for Hallux Rigidus because it maintains stability and motion while preserving the joint itself. This procedure can also be combined with other bone cuts that change the position of the big toe, relieving more pressure at the top of the joint. Recovery time depends on the severity of the Hallux Rigidus and the type of treatment. If a cheilectomy is performed, a hard-soled sandal may be recommended post-surgery. The amount of stress and pressure applied to the big toe will be limited after both surgical and non-surgical treatment types. After the recovery process, most patients are able to exercise, run and wear most shoes comfortably.